1931: Pittsburgh, PA. Fritzie Zivic’s pro debut. Fritzie Zivic KO 1 Al Rettinger. 1936: New York City, NY. Jimmy McLarnin W 10 Tony Canzoneri. 1937: Los Angeles, CA. Baby Arizmendi W 10 Albert ‘Chalk’ Wright. 1952: Havana, Cuba. World Welterweight Championship. Kid Gavilan W 15 Billy Graham. Retains title. The first fight televised in the U.S. from outside the U.S.
1974: Buenos Aires, Argentina. World Middleweight Championship. Carlos Monzon KO 7 Tony Mundine. Retains title. 1976: Johannesburg, S. Africa. WBA Light Heavyweight Championship. Victor Galindez W 15 Kosie Smith, Retains title. 1977: Joshua Clottey born in Accra, Ghana. 1985: Panama City, Panama. WBA Flyweight Championship. Hilario Zapata W 15 Alonzo Gonzalez. Wins vacant title. 1988: Wembley, England. IBF Flyweight Championship. Duke McKenzie KO 11 Rolando Bohol. Wins title. 1991: Reno, Nevada. World Lightweight Championship. 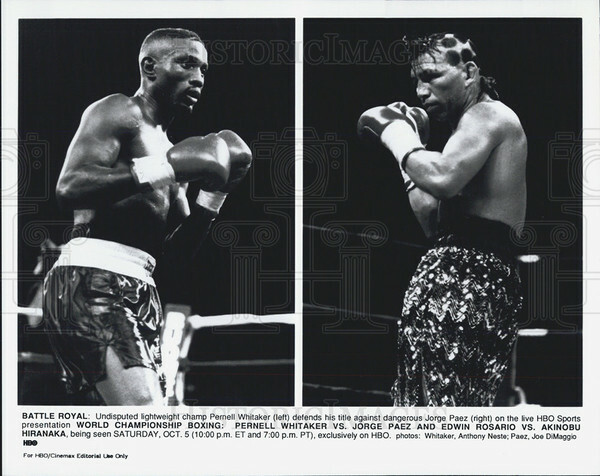 Pernell ‘Sweet Pea’ Whitaker W 12 Jorge Paez. Retains title. 1991: Inchon, S. Korea. WBA Flyweight Championship. Yong Kang Kim W 12 Leo Gamez. Retains title. 1997: Tokyo, Japan. WBA Junior Lightweight Championship. Yong-Soo Choi D 12 Takanori Hatakeyama. Retains title. 2013: Moscow, Russia. WBA/WBO/IBF/ Heavyweight Championship. Wladimir Klitschko W 12 Alexander Povetkin. Retains titles. 1899: Chicago, Illinois. Kid McCoy D 8 Joe Choynski. 1902: Jack Sharkey born in Binghamton, New York. 1956: Sean Mannion born in Rosmuc, Ireland. 1968: Tokyo, Japan.World Junior Lightweight Championship. Hiroshi Kobayashi W 15 Jamie Valladares. Retains title. 1968: Peter ‘Hurricane’ McNeeley born in Boston, Massachusetts. 1974: Katsushige Kawashima born in Ichihara, Chiba, Japan. 1979: McAllen, TX. WBA Bantamweight Championship. Jorge Lujan KO 15 Roberto Rubaldino. Retains title. 1983: Osaka, Japan. WBA Super Flyweight Championship. Jiro Watanabe Tech. Dec. 11 Soon Chun Kwon. Retains title. 1984: Billings, MT. IBF Cruiserweight Championship. Lee Roy Murphy KO 14 Marvin Camel. Wins title. 1989: Bangkok, Thailand. IBF Junior Flyweight Championship. Muangchai Kittikasem KO 7 Tacy Macalos. Wins title. 1990: Pagliara, Italy. IBF Super Flyweight Championship. Robert Quiroga KO 3 Vuyani Nene. Retains title. 2000: Kent, England. IBF Super Bantamweight Championship. Lehlo Ledwaba KO 6 Eduardo Alvarez. Retains title. 2007: New York City, NY. Samuel Peter W 12 Jameel McCline. 2009: Osaka, Japan. WBA World Flyweight Championship. Denkaosan Kaovichit W 12 Daiki Kameda. Retains title. 2012: Kiev, Ukraine. WBO World Light Middleweight Championship. Zaurbek Baysangurov W 12 Lukas Konecny. Retains title. 1927: New York City, NY. World Light Heavyweight Championship. Tommy Loughran W 15 Mike McTigue, NYC. Wins vacant title. 1927: New York City, NY. James J. Braddock D 10 Joe Monte. 1932: New York City, NY. Jimmy McLarnin KO 6 Benny Leonard. 1973: Raul Balbi born in Moreno, Buenos Aires, Argentina. 1975: Yokohama, Japan. WBA Flyweight Championship. Erbito Salavarria W 15 Susumu Hanagata. Retains title. 1988: Berlin, Germany. IBF Super Middleweight Championship. Graciano Rocchigiani KO 11 Chris Reid. Retains title. 1989: Sacramento, CA. IBF Junior Lightweight Championship. John-John Molina KO 10 Tony Lopez. Wins title. 1989: Bordeaux, France. IBF Super Bantamweight Championship. Fabrice Benichou W 12 Ramon Cruz. Retains title. 1991: Inglewood, CA. WBA Super Bantamweight Championship. Raul Perez W 12 Luis Mendoza. Retains title. 1995: Atlantic City, New Jersey. Lennox Lewis KO 6 Tommy Morrison. 1995: Frankfurt, Germany. Dariusz Michaczewski W 12 Phillippe Michel. 1995: Mar del Plata, Argentina. IBF Super Flyweight Championship. Carlos Salazar W 12 Harold Grey. Wins title. 1999: The Father of Buster Douglas, Bill ‘Dynamite’ Douglas dies from colon cancer in Columbus, Ohio. 2000: Las Vegas, Nevada. Paulie Ayala W 12 Johnny Tapia. 2000: Las Vegas, Nevada. WBA Flyweight Championship. Eric Morel W 12 Alberto Ontiveros, Las Vegas. Retains title. 2006: Chicago, Illinois. WBA Heavyweight Championship. Nikolai Valuev KO 11 Monte Barrett. Retains title. 2006: Chicago, Illinois. WBC Light Heavyweight Championship. Tomasz Adamek W 12 Paul Briggs. Retains title. 2006: Las Vegas, Nevada. World Lightweight Championship. Joel Casamayor W 12 Diego Corrales. Wins title. 2006: Las Vegas, Nevada. IBF Flyweight Championship. Vic Darchinyan Tech. Dec. 6 Glenn Donaire. Retains title. 1917: Billy Conn born in Pittsburgh, Pennsylvania. 1934: San Francisco, CA. Fred Apostoli’s pro debut.Fred Apostoli KO 3 Gilbert Attell. 1974: Tokyo, Japan. World Light Middleweight Championship. Oscar Albarado KO 7 Ryu Sorimachi. Retains title. 1975: Sendai, Japan. WBC Bantamweight Championship. Rodolfo Martinez W 15 Hisami Numata. Retains title. 1976: Madrid, Spain. WBA Light Middleweight Championship. Miguel Castellini W 15 Jose Duran. Wins title. 1984: Bangkok, Thailand. WBC Flyweight Championship. Sot Chitalada W 12 Gabriel Bernal. Wins title. 1989: Seoul, N. Korea. WBA Super Middleweight Championship. In Chul Baek KO 11 Ronnie Essett. Retains title. 1994: Halle, Germany. IBF Light Heavyweight Championship. Henry Maske KO 9 Iran Barkley. Retains title. 1999: Laila Ali, 21, the daughter of Muhammad Ali, turns pro with a first-round knockout of April Fowler, a Denny’s waitress, in Verona, New York. 2001: Paris, France. WBA Lightweight Championship. Raul Balbi W 12 Julien Lorcy. Wins title. 2005: Las Vegas, Nevada. Jose Luis Castillo KO 4 Diego Corrales. 2005: Las Vegas, Nevada. Jorge Arce KO 2 Hussein Hussein. 2010: Nonghai, Srisaket, Thailand. WBC World Flyweight Championship. Pongsaklek Wonjongkam W 12 Suriyan Sor Rungvisai. Retains title. 2011: Bacolod City, Philippines. WBO World Light Flyweight Championship. Donnie Nietes W 12 Ramon Garcia Hirales. Wins title. 2014: Biloxi, Mississippi. IBF World Middleweight Championship. Jermain Taylor W 12 Sam Soliman. Wins title. 1939: Des Moines, Iowa. World Welterweight Championship. Henry Armstrong KO 4 Al Manfredo. Retains title. 1945: Jose Duran born in Madrid, Comunidad de Madrid, Spain. 1976: Copenhagen, Germany. WBC Light Heavyweight Championship. John Conteh W 15 Yaqui Lopez. Retains title. 1977: Oita, Japan. WBA Junior Flyweight Championship. Yoko Gushiken KO 4 Montsayarm Mahachai. Retains title. 1985: Seoul, N. Korea. IBF Super Bantamweight Championship. Ji Won Kim KO 1 Seung Il Suh. Retains title. 1988: Seoul, N. Korea. WBA Super Flyweight Championship. Khaosai Galaxy KO 8 Chang Ho Choi. Retains title. 1989: Tijuana, Mexico. “Terrible” Terry Norris W 10 Jorge Vaca. 1993: Manchester, England. WBC Super Middleweight Championship. Nigel Benn D 12 Chris Eubank. Retains Title. 1993: Manchester, England. Championship. Crisanto Espana KO 10 Donovan Boucher. Retains title. 1993: San Juan, Puerto Rico. IBF Junior Lightweight Championship. John-John Molina KO 8 Bernard Taylor. Retains title. 2000: Nagoya, Japan. WBA Super Flyweight Championship. Leo Gamez KO 7 Hideki Todaka. Wins title. 2002: Tokyo, Japan. WBA Super Bantamweight Championship. Salim Medjkounw W 12 Osamu Sato. Wins title. 2004: Erfurt, Germany. WBC Super Middleweight Championship. Markus Beyer KO 6 Cristian Sanavia, Regains title. 1912: Sam Langford KO 11 Sam McVey, Perth, Australia. 1930: New York City, NY. Jackie ‘Kid’ Berg W 10 Billy Petrolle. 1942: Chartchai Chionoi born in Bangkok, Thailand. 1953: Mustafa Hamsho born in Latakia, Syria. 1962: Tokyo, Japan. World Flyweight Championship. Fighting Harada KO 11 Pone Kingpetch. Wins title. 1971: Genoa, Italy. WBC Light Welterweight Championship. Bruno Arcari KO 10 Domingo Corpas. Retains title. 1971: Sendai, Japan. WBC Junior Lightweight Championship. Ricardo Arredondo KO 10 Yoshiaki Numata. Wins title. 1975: Daniel Santos born in San Juan, Puerto Rico. 1976: Tokyo, Japan. WBC Super Bantamweight Championship. Royal Kobayashi, KO 8 Rigoberto Riasco. Wins Title. 1976: Kofu, Japan. WBA Junior Flyweight Championship. Yoko Gushiken KO 7 Juan Guzman. Wins title. 1982: Tokyo, Japan. WBA Junior Flyweight Championship. Katsuo Tokashiki W 15 Sung Nam Kim. Retains title. 1987: Las Vegas, Nevada. IBF Middleweight Championship. Frank Tate W 15 Michael Olajide. Wins vacant title. 1987: Paris, France. WBC Lightweight Championship. Jose Luis Ramirez KO 5 Cornelius Boza Edwards. Retains title. 1990: London, England. WBC Light Heavyweight Championship. Dennis Andries KO 4 Sergio Merani. Retains title. 1992: Cartagena, Colombia. WBA Bantamweight Championship. Jorge Eliecer Julio W 12 Eddie Cook. Wins title. 1998: Paris, France. WBA Welterweight Championship. James Page KO 2 Andrei Pestriav. Wins vacant title. 1998: Paris, France. WBA Light Welterweight Championship. Sharmba Mitchell W 12 Khalid Rahilou. Wins title. 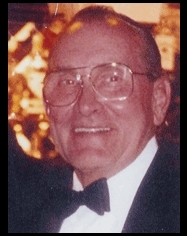 2001: Hall of Fame trainer Eddie Futch, 90, dies in Las Vegas, Nevada. 2003: Marseille, France. WBA Light Heavyweight Championship. Silvio Branco KO 11 Mehdi Sahnoune. Wins title. 2005: Tokyo, Japan. WBC Flyweight Championship. Pongsaklek Wonjongkam KO 7 Daisuke Naito. Retains title. 2009: Tokyo, Japan. WBA World Junior Lightweight Championship. Juan Carlos Salgado KO 1 Jorge Linares. Wins title. 2009: Manhattan, NYC, New York. WBO Super Bantamweight Championship. Juan Manuel Lopez W 12 Rogers Mtagwa. Retains title. 2009: Tokyo, Japan. WBC World Super Bantamweight Championship. Toshiaki Nishioka KO 3 Ivan Hernandez. 2010: Tlalnepantla, Mexico. WBA World Super Flyweight Championship. Hugo Fidel Cazares KO 9 Alberto Rossel. Retains title. 1913: Pittsburgh, PA. World Middleweight Championship. George Chip KO 6 Frank Klaus. Wins title. 1920: Jersey City, NJ. World Light Heavyweight Championship. Georges Carpentier KO 4 Battling Levinsky. Wins title. 1923: Boston, Mass. Tommy Loughran W 10 Harry Greb. 1923: Baltimore, Maryland. World Flyweight Championship. Pancho Villa W 15 Benny Schwartz. Retains title. 1927: San Antonio, TX. Baby Arizmendi’s pro debut. 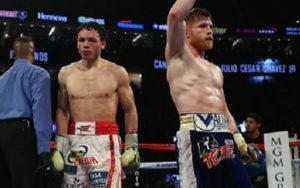 Baby Arizmendi D 10 Kid Laredo. 1969: Buenos Aires, Argentina. World Light Welterweight Championship. Nicolino Locche W 15 Joao Henrique. Retains title. 1975: Ponce, Puerto Rico. WBA Welterweight Championship. Angel Espada W 15 Johnny Gant. Retains title. 1981: Taejon, S. Korea. WBA Junior Flyweight Championship. Hwan Jin Kim W 15 Alfonso Lopez. Retains title. 1988: Atlantic City, New Jersey. Bernard Hopkins’ pro debut.Clinton Mitchell W 4 Bernard Hopkins. 1992: Tokyo, Japan. WBC Strawweight Championship. Ricardo Lopez KO 2 Rocky Lin. Retains title. 1993: Inglewood, CA. WBA Junior Lightweight Championship. Genaro Hernandez W 12 Harold Warren. Retains title. 1996: Las Vegas, Nevada. 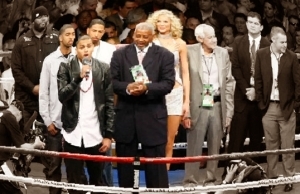 Floyd Mayweather’s pro debut.Floyd Mayweather Jr. KO 2 Robert Apodaca. 1996: Las Vegas, Nevada. Johnny Tapia KO 7 Sammy Stewart. 1997: Sheffield, England. WBO Super-Middleweight Championship. Joe Calzaghe W 12 Chris Eubank. Wins vacant title. 1997: Sheffield, England. WBO Featherweight Championship Naseem Hamed KO 7 Jose Badillo. Retains title. 2000: Yokohama, Japan. WBA Lightweight Championship. Takanori Hatakeyama KO 10 Hiroyuki Sakamoto. Retains title. 2002: Campione D’Italia, Italy. WBC Cruiserweight Championship. Wayne Braithwaite KO 10 Vincenzo Cantatore. Wins vacant title. 2007: Tokyo, Japan. WBC Flyweight Championship. Daisuke Naito W 12 Daiki Kameda. Retains title. 2008: Berlin, Germany. WBC Heavyweight Championship. Vitali Klitschko KO 8 Samuel Peter. Regains title. 2008: Las Vegas, Nevada. IBF Light Heavyweight Championship. Chad Dawson W 12 Antonio Tarver. Wins title.